The Sleep and Beyond Organic Wool Comforter is made with rolled and carded organic merino wool quilted between a silky soft 300 thread-count organic cotton sateen cover. If you haven’t tried a wool comforter, I definitely recommend it. A lot of people hear “wool” and think that it will be hot and sweaty. Unlike a comforter filled with down, down alternatives or even cotton, wool is very breathable and wicks moisture away from your body, allowing you to stay dry and warm. This makes it a great temperature regulator. It helps keep you cool and dry in the summer and warm in the winter. 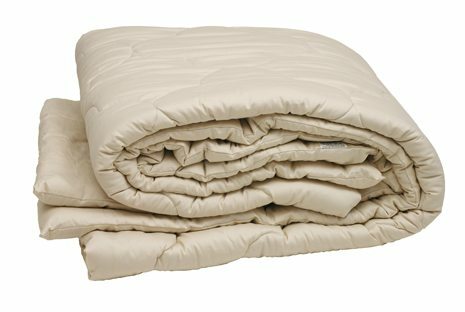 The Sleep and Beyond Organic Wool Comforter is my favorite because it’s an all season comforter. It’s not too heavy for the summer, and it’s great for winter too, with an extra blanket needed only for those extra cold evenings. I also love that it’s completely organic and VOC free, which means I’m sleeping comfortably under clean, healthy, organic materials. Make the switch to an organic wool comforter; your only regret will be not making the switch sooner! This month, you can enter to WIN a Sleep and Beyond Organic Wool Comforter, choose your size (a value of $279-$319)! Contest runs from October 1st, 2013 to October 31st, 2013. No purchase necessary to win. Contest is now over. The winner of this contest is Mary O. from Viroqua, WI. Congrats!